Mike was born and lived the first 40 years of his life in Catskill, New York. From there he moved to Colorado for ten years, and he’s been in Dayton for about one and a half years. Mike said choosing a best find was a hard decision, that in over 30 years detecting there have been so many great finds. One that will always stick his head is a spill of five large cents on Rogers Island in the Hudson River in Catskill. Mike didn’t start detecting until he was about 20 years old, but remembers the very first thing he found, even before a bottle cap or piece of foil, was a man’s gold high school class ring! Mike said he joined one detecting group that had over 100 members. He recounted that he attended just one meeting because only one person bothered to talk to him. He never went back. 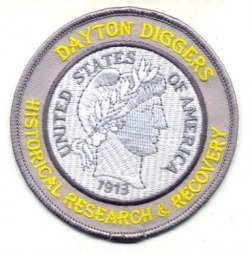 He was glad to have found the Dayton Diggers through the TreasureNet website. He said the Diggers are a great group of people and he’s looking forward to spending more time with us and getting to know us better. Mike noted that the Diggers’ Sunday night meeting schedule is difficult for him. He explained that, “It’s the one night we get together with my daughter, son-in-law and grandkids. My daughter is a Captain in the Air Force, stationed in Afghanistan right now and she made us promise to keep it up while she’s gone. That’s a promise I can’t break. Only nine days of a six month tour left. Then, one Sunday a month won’t be so important.” A hats off salute to your daughter and all who are serving with her.